Are you sitting down? Honda's got a novel concept. The Honda EV-STER is electric, but, wait for it...rear-wheel drive. Hmm, where have we seen a RWD, two-seat electric roadster before? Oh, right, Tesla. 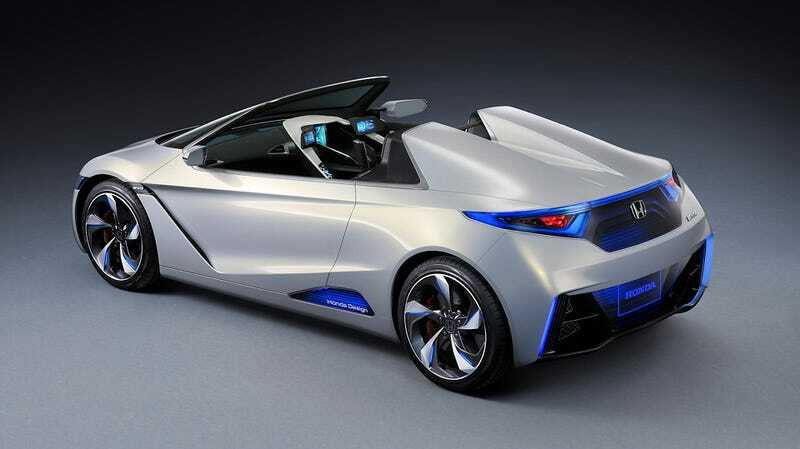 But this one's different; it's a Honda, which means it's only a concept. Because, despite the spin some have swallowed like so much expensive-yet-crappy Makuhari Messe sushi, it won't help make Honda awesome again. Carrying a relatively wimpy 10kWh of lithium-ion batteries, the EV-STER is only good for a maximum range of 100 miles (which sounds ambitious), a 0-to-37 MPH time of 5.0 seconds and a top speed of 99 MPH. So, basically, Honda didn't build a Tesla. They built a really, really slow Tesla that doesn't go very far. For purposes of comparison, the Tesla roadster carries 53kWh of electricity onboard, while the two-wheeled Mission R electric superbike manages 14.4kWh. Kilo-what? Luckily, you can tell the EV-STER isn't even remotely production-realistic not only because its lit-blue grille would be illegal, but because it's equipped not with a steering wheel, but with two levers instead. But even if it were — you know this wouldn't be Honda's next step on a path back to awesome, fun cars. If you remember, folks were saying that right before the CR-Z came out. And look what happened with that. This concept will not recapture "Honda's sporting spirit." But, it is a neat-looking flight of fancy. That strong wedge shape looks purposeful, something backed up by the driver-focussed cockpit, which features a body-color driver's seat and three, count ‘em three, LCD screens full of info on the dash. It's actually these dash displays that will probably be the takeaway from the EV-STER; expect something similar to roll into next-gen Honda Hybrids, these look remarkably like an updated take on the eco-meter thingies in the Honda Insight.